And as a mother of three children under 5, frankly, I need my sleep. So do my children, which is why I have always put clocks in their rooms to help them know when to wake up either from naps or overnight sleep. And it has always provided a great way to ensure they are getting enough rest and so am I! Our favorite clock, by far, that we have used with our kids is the My Tot Clock. It was the first clock my oldest used when he started waking up WAY TOO EARLY and it worked like a charm. Now they have a new improved version and my oldest is now enjoying this one even more! So What Is My Tot Clock? My Tot Clock is the first all-in-one sleep clock, alarm clock, nightlight, timeout timer, and activity timer for tiny tots who can’t yet tell time. The magic of My Tot Clock is that it changes color to teach little ones when it is time to sleep (blue light) and when it’s okay to get out of bed (yellow light). My Tot Clock, with its child-friendly analog clock display, also plays bedtime stories, lullabies, fun wake-up music, and even white noise to make the traditionally stressful bedtime and morning routines more enjoyable. No more negotiating before bedtime! 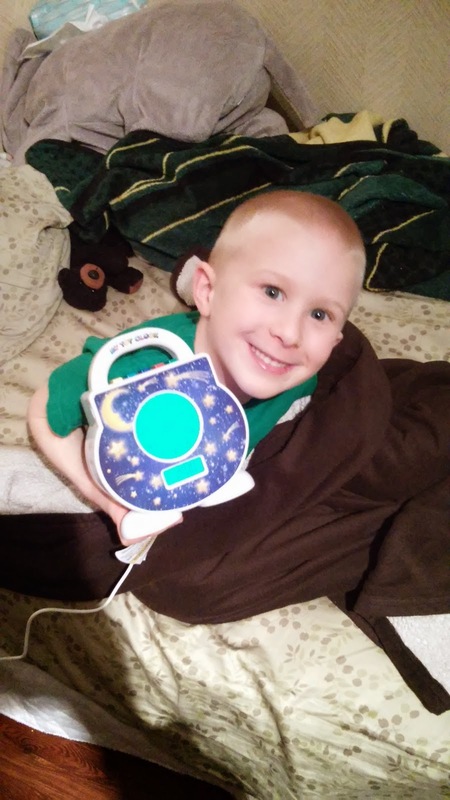 My Tot Clock also includes a light blue light for nap time or quiet play time, a red light for timeout, and a green light for any positive timed activity like potty training and picking up toys. Managing important tot time has never been easier! My Tot Clock is the perfect parent-helper gift for any household with small children. Each unit comes with the "Welcome to Children's Dreamland" Tot Clock Treasure, the "Night Sky" Faceplate, and AC Adapter. The unit measures 9" x 7.5". 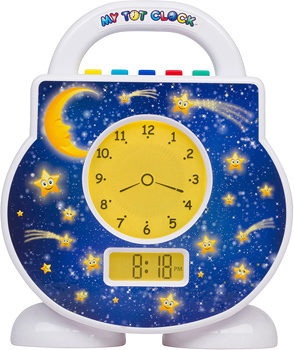 My son absolutely loves this clock and loves to push the buttons for naptime and bedtime and hear the stories and songs play to help him fall asleep. I love this new and improved version that has the buttons on the inside of the faceplate - they are easy to access and hidden from little fingers. This clock is easy to set up, I love that you can schedule how long you want a time out, nap time, or timed activity to be. It is the only clock I have seen that has all of this in one! Best of all, the My Tot Clock is a mommy-invented product. It was designed and developed by Pamela Gonzalez, President of White Dove Innovations. I love supporting other moms and their ingenious ideas! You can purchase the Tot Clock from White Dove Innovations at www.mytotclock.com for just $49.95. A selection of different interchangeable Tot Clock Faceplates are also available for boys and girls to choose from, for just $9.95 each, along with several additional Tot Clock Treasure audio bedtime stories including: Goldilocks and the 3 Bears story, The Little Red Hen, Sleeping Beauty, Princess and the Pea, The Town Mouse and the Country Mouse, and The Hare and the Tortoise, each of which comes with five lullabies, a fun wake song, and a white noise track, for just $12.95 each. And make sure to use discount code MomBlog10 to receive a 10% discount off of your order! (1) My Tot Clock to a lucky winner!